Scaffolding is a way of working with unconventional texts — primary and secondary source documents of all kinds — that draws on techniques, skills, and perspectives from not only what would be considered traditional theatre practices but also from the visual arts (collage and assemblage) and qualitative research methods (phenomenology, heuristics, and case study). At times, Scaffolding looks like adaptation; at others, a method of devising. It’s really just one approach, one way in to discovering (through iterative questioning), constructing (through the creative process), and embodying (through performance) th emes and meanings in textual data. Poems, narratives, histories, interviews, diaries, blogs, public records, newspapers, surveys — whatever has been written and said about what it’s like to be human. The essential nature of the “lived experience” of being human. 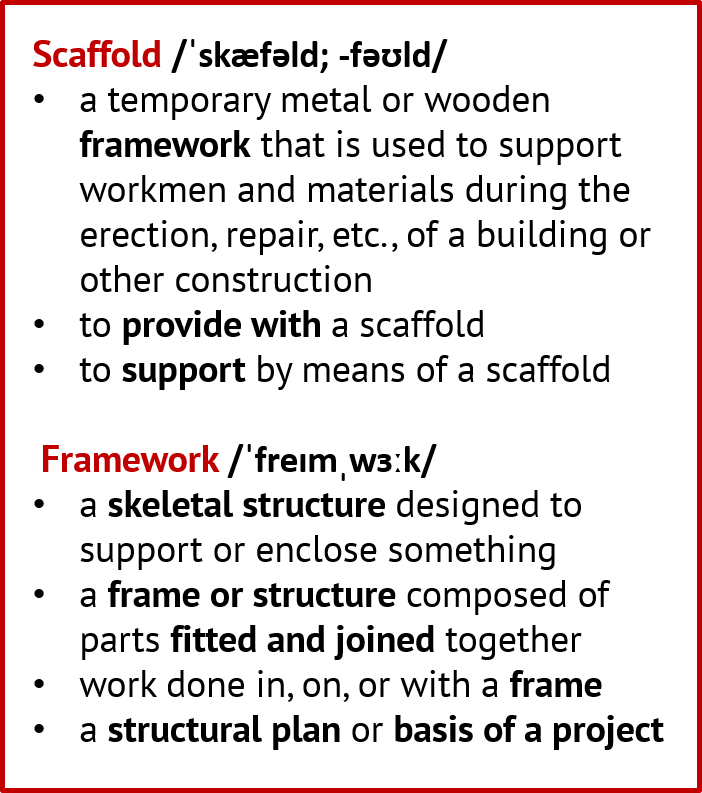 This Casebook is an evolving document in the same way that Scaffolding is an evolving practice. What is it, what’s its “provenance” and influences, how did it come about, what’s it good for, who might use it, and of course — how to use it? How to borrow bits and pieces from the Scaffolding tool bag to solve knotty playmaking problems? Although Scaffolding strategies and activities can be used as learning experiences in a classroom or rehearsal hall, they are first and foremost tasks and tools that lead to a performative event. They can inform the processing of texts or artifacts and settings that are “read” as texts, but will remain merely interesting demonstrations of technique unless linked with making a play. • Research is the scaffold for making and doing, creating and producing, testing and critiquing. • Technique that allows for hiding and ambiguity as well as for revealing and certainty is a mature technique. • Craft and skill want to be married to spontaneity and impulsivity. Or at least engaged. • Setting constraints is a cornerstone of creative work, whether in everyday, scientific, or artistic domains. • Games are practice, not the real thing. << Download a pdf of the Casebook. Or explore section-by-section by clicking a button.